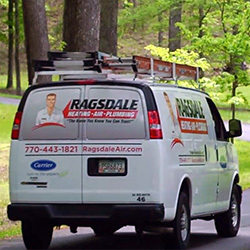 Ragsdale Heating, Air & Plumbing has been serving Acworth and the Atlanta metro area with plumbing, heating & air conditioning repair, service and replacement for over 20 years. Our entire team, from the office staff to our plumbers and HVAC technicians, is committed to delivering the best experience possible. When know how frustrating plumbing and HVAC problems can be. That's why providing prompt service, carefully diagnosing the issue, listening to your input and explaining our findings are important to us. We want to make sure you understand what repair or replacement options you have, and how much the work will cost. Whether you need routine HVAC maintenance, emergency plumbing repair, replacement equipment, or a complete new heating and cooling system, Ragsdale is the name you can depend on. We are the plumbing and HVAC contractor your friends and neighbors in Acworth count on for all their home comfort needs. We want to make sure your experience is completely hassle-free and enjoyable. We will do everything in our power to provide complete satisfaction when you call us for all of your plumbing, heating and cooling needs. When your heat pump, furnace or air conditioner stops working, you need to turn to an HVAC contractor that has experience and can get it up and running quickly, and correctly. That's why you can depend on Ragsdale! Our expert HVAC repair technicians have the skills and knowledge to repair any heating or air conditioning problem you are experiencing in your Acworth home. We can repair all makes and models of HVAC systems and we offer a 100% satisfaction guarantee. You can't go wrong when you choose Ragsdale for your heating and air conditioning repair needs! Our heating & air conditioning repair experts are technicians, not salespeople. When your furnace, heat pump or air conditioner needs repaired, their focus is on finding the best solution to fix your HVAC system, not selling you things you don't need. We hire only the best and friendliest people and our heating and air conditioning repair technicians are experienced and factory-trained so they can handle any HVAC problem you throw at them. When problems arise and you need a plumber in Acworth, you can count on Ragsdale. We provide emergency plumbing service and our talented plumbers have the tools and knowledge to diagnose and repair plumbing problems quickly and correctly. Our plumbers will perform a thorough examination of your plumbing issue and take the time to help you understand all your repair or replacement options. We also offer flat-rate pricing on all our plumbing services, which means you'll know what the cost will be at the start of the repair, no matter how long it takes to fix the problem. All of our plumbers go through an extensive background check before getting hired. We only work with the best plumbers around, which is reflected in the more than 1,000 five-star reviews we have received. Ragsdale Heating, Air & Plumbing is proud to provide Acworth with a wide assortment of plumbing and HVAC products and services to meet all your home comfort needs. Schedule your next service online with Ragsdale or give us a call at (770) 443-1821. "The HVAC technician from Ragsdale was on time, courteous and very professional. He quickly fixed our problem. We will recommend Ragsdale to anyone needing HVAC repairs or service."